Here are a couple of examples of the meals I prepare for myself, as I mentioned before, I aim to make a meal for less than £1. 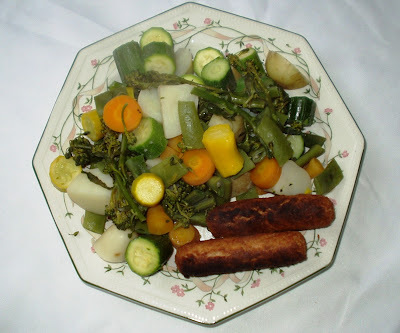 Most of my dinners consist of steamed vegetables, with something added. I very rarely fry anything because it makes a mess of the cooker, and greasy food is not good for you, I prefer to grill things. I don't use the oven very often because it uses a lot more gas than cooking on the top. I can't see the point of putting a casserole in for a couple of hours when you can cook a perfectly good stew in a pan on the top in 30 minutes. One of the advantages of not eating meat. I have a two tier steamer but I only use one tier, this is great for putting everything in, and eating the meal ten minutes later. People say they haven't time to cook meals from scratch, but preparing vegetables only takes a few minutes, and once in the steamer you can forget about them while you prepare the rest of the meal. I also have one of those metal colander type things that folds like an umbrella, you put it in a pan with an inch of water and steam your veg in there, or I sometimes steam in the microwave. This was a meal I had in the summer. All the veg came from my garden, potatoes, yellow and green courgettes, broccoli, carrots, runner beans, and broad beans. The two veggie sausages cost about 33p, I only buy them when they are on special offer. This is the meal I have eaten tonight, 3 shop bought carrots @ 39p a big bag, cabbage, reduced to 25p, 2 onions @ 50p a big bag. 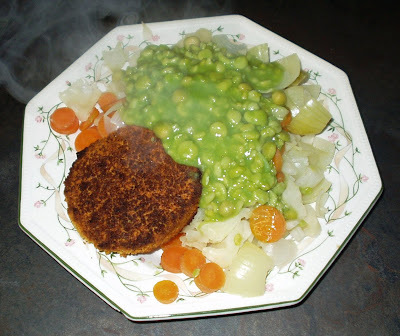 Tin of mushy peas 15p, and a veggie burger special offer 80p a box of four. A meal for less than £1. 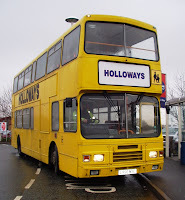 I got the free bus to Tesco again today. A lovely warm comfortable coach came along to pick us up instead of the bog standard lumbering double decker as in the photo last week. I nearly missed it, as I stepped out of my door it was there at the end of the road. I did a quick sprint whilst frantically waving my arms to attract the drivers attention, I just made it as he was about to pull away. When we got there, I told the driver not to wait for me as I was going to walk back, it's only five miles. Who says that you have to go in the shop just because you ride on the bus, why not use the service for a free ride. B & Q lorry passing by. I had a smile on my face, it felt good to be out in the wide open space with no timetable, no deadlines, no pressures. I had a sudden urge to raise my arms to the heavens and shout at the top of my voice, I'M FREE ! ! ! I suddenly rememberd that the distribution depot where I have been working for the last seven years is closing tomorrow, so today I took the opportunity to call in and say my goodbyes to everyone. The closure was first announced in October, I was expecting to go back to work after recovering from my operation, that same weekend the news broke. As I was an agency driver I was one of the first to be laid off. 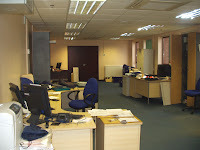 It was sad to go in today and see the place stripped bare, the stock in the warehouse has been shipped to the remaining depots around the country, the trailers and units are to be delivered tomorrow. There was a sombre mood about the place as everyone contemplated what their next move is. Most of the drivers are transferring to the Doncaster depot, which will mean more than an extra hour on their daily travelling time, not something to be relished on top of a 12 to 15 hour day. But they have no choice, it's either travel or become unemployed. 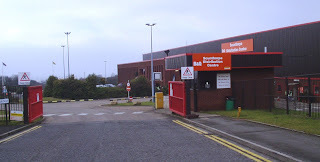 The warehouse staff have little chance of finding work, one woman said she had got some work in a care home, but the rest didn't sound hopefull. I feel for the people who still have a good many working years ahead of them, I wish I could pass on some of my money saving knowledge to them, because they are going to need it. This kind of situation is happening all over the country, a very sad state of affairs, peoples lives are being turned upside down, and they are going to have to make some big changes. I tell everyone wherever I go, that there is life after money. I want to hug them all and tell them not to worry, but of course they will. Good luck to my B & Q Scunthorpe collegues. 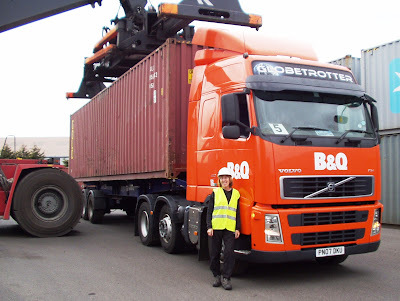 Me and my truck at Immingham Docks. Daily spend - £1 veg seeds. £3.95 cat food. A bit of excitement today, the phone rang this morning, a researcher asking me all about my frugal lifestyle, she had seen me in the film three weeks ago and thought I would fit in with a television programme they are recording. It sounded really good, I asked a friend if she wanted to come and she was up for it. They said they would send a car to take us down to Kent, an overnight stay in a hotel, then to the TV studios tomorrow morning. How exciting is that. 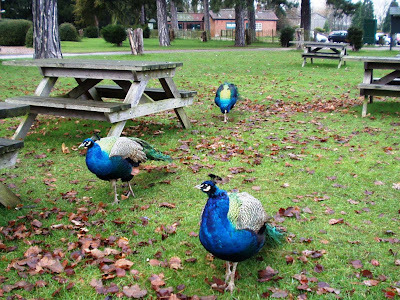 Several phone calls went back and forth, I thought, oooh, they are really interested in me. I could just picture me and Pauline swanning down the motorway in the back of a limo, sipping champers, propping the bar up in the hotel tonight, the life of a celeb, can't be bad. We were getting excited. I should have realised there was a twist to it. The producer told me about a man that was going to be on the programme, he has eleven children and has given up his job because because he gets more money from the state, and what do I think about it. Warning bells sounded, I suddenly twigged. They had delved into my personality because they wanted someone fiesty and opinionated to confont this man on screen in front of millions, my money saving and frugal living was of secondary importance. I told him that I was not going to take part in a verbal punch up, I don't do confrontation, that is not what I am about. I might have an opinion on it but I am not about to play up to the cameras just to boost their ratings. I said it was underhanded and it wasn't honest to lead people on like that. Yes I can be fiesty when I want to be. I have discovered that going to night classes at the college is saving me money. OK, I know I have to drive myself there, but it isn't far, it only takes fifteen minutes. Last night I started Psychology, and tonight was social Sciences, these courses are over ten weeks. Now the good part is that they are free, and the bonus is that I go past Tesco to get there. They finish at 8.30pm, an ideal time as I mentioned before, to go shopping. Last night I got some amazing bargains, bread at 7p a loaf, chicken slices for the cats for 30p, pack of six youghurts for 10p, and a £7.50 Dalek cake for 72p, plus some other reductions. I reckon if I only shop at this time for the next nine weeks I can save a fortune. I am getting to the stage where I don't want to pay full price anymore, and I'm thinking it might be possible to have every single item in my trolley either with a yellow sticker on, or a special offer, or a BOGOF offer. I'm going to try it. It might mean changing from a brand that I normally buy, but I can be flexible to save money. It isn't important for me to stick to the same food every week, so some changes might make it interesting. Of course I wouldn't buy a special offer if the reduced price was way above what I would normally pay, because it was a very expensive item in the first place. I have a lot of prices fixed in my head, and I can never be tempted by something that is not what it appears. My head has an inbuilt calculator. Last week I worked out that two boxes of sugar cubes was cheaper than a bag of sugar at the same weight. Thank goodness I took notice of mental arithmatic at school. 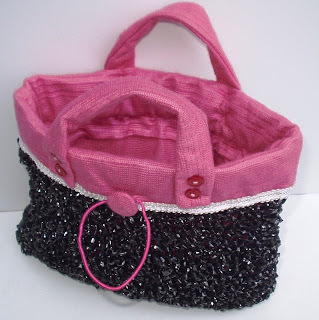 Just finished my handbag, knitted with video tape. Measurements are 11" x 9". The pink fabric is from a very old curtain, the white lacey trimming I salvaged from a skip (lampshade), small buttons from my button box, pink elastic from a box of chocolates, two metal buttons you cover yourself my friend gave me. It's easy to make, knit an oblong piece, twice the size you want the bag, fold in half. The video tape will not slide along the needles as you knit and there is no give in the tape, so you have to adjust the tension of every stitch. Cut the lining longer, so you have enough to fold over and enclose the edge. Cut two long pieces for the handles, sew along the edge and turn inside out and neatly sew the end. You can decorate it with any trimmings you have. I must admit, I don't really like Sundays, everything seems so quiet, I suppose at this time of the year everyone stays indoors. The weather wasn't too bad so I got out into the garden. It's looking pretty bare at the moment, but as it's brown bin day tomorrow I decided to do a bit of tidying to fill it up. I picked the last few brussel sprouts and pulled up the stalks and raked over the raised beds. The compost heap is humming away nicely, covering it with old plastic compost bags keeps it cooking. 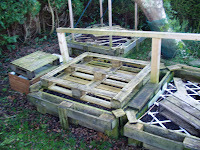 I built the raised beds out of pallets, cut them in half and stand them on their ends. Nail them together with odd pieces of wood, and make a row of three. Down the centre I put some upright posts with cross bars which I put plastic sheeting over when the plants are small. 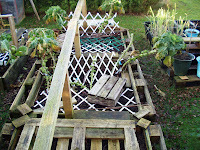 Thay are covered with trellis and pallets at the moment to keep the cats off. I'm already thinking about what veg I am going to grow this year, if it's anything like last year I shall be eating off the garden all summer. My living room is beginning to look like a workshop, there are two dining room tables which are now covered in works in progress, and all manner of collected bric a brac that might come in usefull to make something. I finished a loaf of bread, and looked lovingly at the wrapper wondering what else I could do with it other than use it for a dog poo bag. I got the scissors and turned it into strips, I cast on a few stitches with it and knitted a few rows, just to see what it looked like. It had a silver coating to it and looked quite sparkly, I wonder where I can get some more of those, a cafe perhaps? 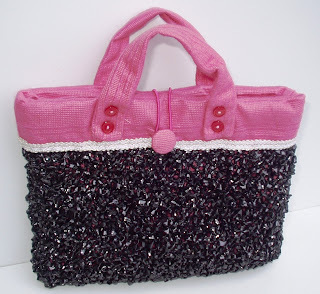 My handbag knitted out of video tape is almost finished, I've only got to attach the handles. I must say it's looking great, I decided to line it with a piece of dusky pink fabric, will post a picture when it's ready. By the way, charity shops are a good place to get knitting needles, I got five pairs for £1. 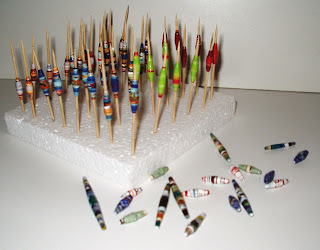 I've been making beads out of coloured paper, mainly brochures and leaflets, I seem to remember doing this years ago. I cut long narrow pieces of paper, one inch wide at the bottom, tapering to nothing at the top. Then starting at the bottom, wrap it tightly round a toothpick. About 2 inches from the top add a blob of glue to stick the end down, then give it three or four coats of varnish. I have been experimenting with different sizes and colours, when I have enough I will make a necklace or use them for decoration. Shall I shan't I? I couldn't make up my mind this morning whether to get the free bus to Tesco. 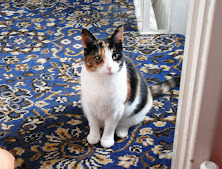 I didn't actually need any shopping, but I thought I would go and get some more half price cat food while it is cheap. 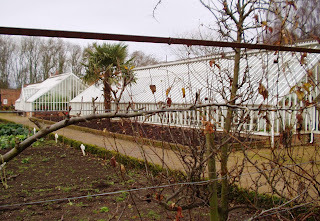 I had a look round the garden centre nearby while I was there. I don't normally buy anything because it is so expensive, but it's nice for a browse. I did give in however, there were two plants at 50p each, a conifer, and a heather, they looked like they needed some TLC so I rescued them. Into Tesco for the last half hour, nothing to take my fancy in the reduced chiller cabinet, so I got some bananas and grapes on special offer. 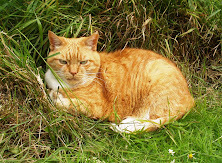 Oh no, they have sold out of cat food, expecting some more to come in, that's a bit annoying. Then I remembered I needed some cereal. 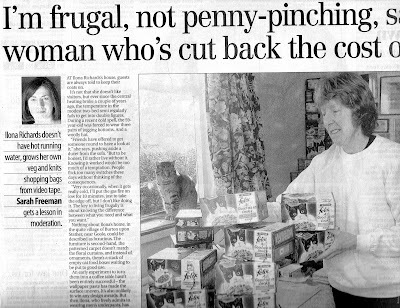 I have been monitoring the price of my bran flakes, it seems to change every week. Now they are 71p for a 750grm box, better than 78p last week, so I got five boxes. A quick look in the milk section for my soya milk, shock horror, it has gone up from £1.12 last week to £1.26, that's a big jump. I'll give it a miss today because I have got two cartons in, but I'll be watching for it to go down again. Why do they change the prices so much, you have got to be a sprinter to keep up. I was back home by 12.10pm, a great bus service, more people should use it. One shop not to shop at. I overslept this morning, that sounds daft when I don't have anything pressing to get up for, except that today is my fortnightly visit to the Job Centre. Just made it with a minute to spare. I waited my turn, I heard my name being called but couldn't see where it was coming from. There have been that many new people registering for job seekers, that they have had to increase the amount of signing desks and train up staff to deal with the influx. I dutifully reported what jobs I have applied for. There was no point in trying to access the job vacancies computer points, all of them had a notice on saying out of action, probably run out of jobs, shut up shop, sorry no jobs. I decided on a bit of research around the town centre. We have one of those shops where you can buy household items like furniture and electrical goods, and pay weekly, they seemed pretty busy. The banners said, 'Beat the Crunch, No Deposit, and No Credit Checks.' I studied what was on offer through the window. A pair of quality refurbished (it said so on the sign), two seater, brown leather sofas. A bargain price (?) for cash £654.12. If you want it on the never never, tick, or slate, whatever you like to call it, you can pay £13.58 per week for 55 weeks, giving a total of £746.90. Then it gets worse, if you want to include a service cover in that it would be £16,98 per week, making it £933.90. My god, is anyone daft enough to fall for that, it seems they are judging by the number of people who stepped inside and handed over their cash. The main item in the window to pull in the punters, was a strategically placed 42inch refurbished Ambilight Philips TV, so placed to catch the eye of everyone passing. If you want to pay cash it is a snip at £792.06, I think not. You could elect to pay £8.77 over 120 weeks making it £1,052.40. If you want to include service charge cover and digi service cover that will be £13.49 per week, making it a total of £1618.80. What was horrifying was that there was no posh, well dressed, obviously affluent people crossing the threshold while I was standing there, they looked like they were families struggling to make ends meet. These refurbished goods they are selling are possibly reposessed from people not able to keep up the payments. What annoys me is they way the shop advertises 29.9% interest, doesn't that sound a whole lot better than 30%, a devious trick. I wanted to stop everyone going in and say to them don't do it, you are signing your life away. Get a sofa out of the charity shop down the road, you don't need a tele that big, but I didn't want to get arrested. These shops are like piranha fish, they will strip you bare, they prey on peoples weaknesses, and vulnerabilities. They don't bring hopes and dreams to people, they bring misery. These are the shops that should be going out of business. I like to wake up in the morning, look out of the window, and think what shall I do today. After an hour or two of knitting video tape, (I am making a bag), and making beads out of paper, the sun came out, so I took myself off to Normanby Park about two miles away. It's a pleasant walk past the playing fields and the new allotments, follow the footpath along the edge of the fields, turn right on the road and you're soon there. 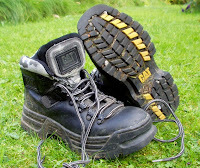 I'm putting a picture of my boots here because I am rather pleased with them. I found them at a car boot sale for £4, and they were hardly worn. They have massive soles and will last me for the rest of my life. 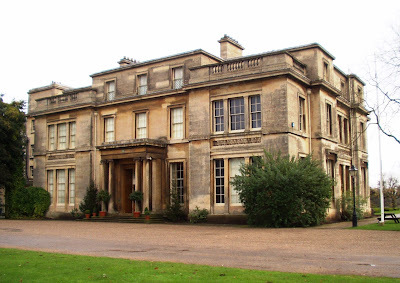 The park has a big hall, walled garden, deer park, duck pond, tea room, and woods to ramble through. It's funny that people don't usually visit places that are virtually on their doorstep. I must admit that I only come to Normanby during the winter months, because there is a charge to enter in the summer, even if you just want to walk in the woods. I like walking for the excercise and it's free. I took these photo's. A quick check on the internet this morning, and I see I am in today's Yorkshire Post. The article in the paper is bigger than the one on the web site, almost a full page on the broadsheet, and a picture on the front page. This is scanned and copied from the paper. If you want to see the electronic version, click here. I started college tonight, a 10 week course called Introduction to Social Sciences. The first half an hour was spent introducing ourselves, there was 20 in the class, and we discussed why we had chosen that particular course. Guess what? I wasn't the only one that had joined because it is free! 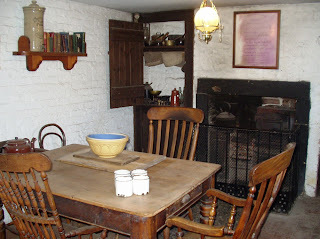 I also said it was because I wanted to get out more, sit in a warm place and chat with people. The teacher was very lively she makes the subject quite entertaining, it was like a free night out watching stand up comedy. I am looking forward to the rest of the course. I have to pass Tesco to get there, so I seized the opportunity to call in on the way home to catch any last minute bargains before they clear the shelves of the last day items. Boy was I pleased I did. My £1 a meal limit. I've just eaten half of a very big apple pie. I had a lot of apples given to me in October, far too many to eat at the time. I read somewhere that you can store them by wrapping them in newspaper, and putting them in boxes, in a cool dark place. The plastic trays I get out of the chinese takeaway bin are ideal for this purpose, they get their mushrooms in them and just throw the trays away. I checked all the apples, only a few had to be dumped on the compost heap, the rest are keeping quite well. The short crust pastry mix came out of a packet, reduced to 27p because it was out of date, tasted fine to me. So, along with a big dish full of veggie stew I had earlier, I reckon my meal tonight has come within my £1 limit. I'm having a pottering day today, I love pottering. just pegged the washing out on the line, I only wash when it's sunny or windy, now I'm having a banana and honey sandwich on brown bread while I decide where to potter next. I found an empty cola can in the street, I thought, aha, what can I make with that. I cut the bottom off, straightened out the ringpull for the base, and cut strips downwards with a large pair of scissors. Then I gripped each one between finger and thumb and pulled from the bottom upwards which made them curl. And here we have a tea light holder. 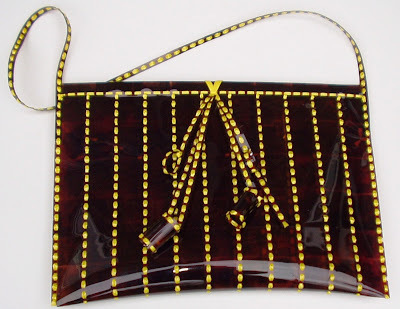 Next is a handbag I made out of 35m negatives, I think everyone must have a stash of these somewhere in a drawer. I started by joining them together, weaving some narrow ribbon through the holes, until I had a sheet. Then I folded it in half and joined the sides. I added some decoration and a handle, a handbag, albeit not a very usable handbag, but the idea is there to maybe put a lining in it. I'm not sure of the longevity of the negatives, probably forever because I have had some of them for ten years or more. Here is my magazine holder, I wanted one to keep my 12 copies of Gardeners World tidy, and handy for reference. There is one advertised in the magazine for £6.99, but I thought I can make one for a few pence. I found a strong box that was close to the size I wanted, cut it to size and stuck it back together with parcel tape. Then I cut some flower pictures from some old gardening magazines that my uncle gave me, and made a collage, sticking them to the box. I finished it by covering it in sticky back clear plastic. It's a funny sort of day, started dull and wet, then it brightened up so I took myself off for a power walk. I call it a power walk because I like to stride off with a sense of purpose, to keep myself fit, although my pace is probably only slightly faster than a dog walk. 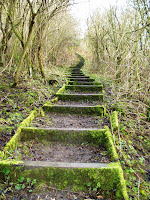 I went up the lane to the water tower, then turned along the farm track through the fields. I was glad I had a hood on my jacket, the wind was bitingly cold. This sort of walk sets me up for the day, blows the cobwebs off. I just can't walk past a skip without having a nosey in it. I was on my way to the shop and someone in the next street is having some building work done. I spotted some very usefull pieces of wood in it, so I walked down the drive to the house, and yelled through a half open window, can I have some wood. A man yelled back, yes, take anything you want out of the skip. Thanks mate! Oh core blimey, I am on yoooootuuuube. I've had a busy day today. This morning I got the bus to Asda, it comes past the end of my road so it's practically a door to door service, and it's free, so I might as well use it if only to keep the driver in a job. I had a good scout round, first to the shelves in the top left hand corner to look for reduced prices, nothing I fancied there and not cheap enough. I found a good deal on mature cheese, 500grm for £2, better than the 400grm I picked up last week for the same price. Fresh salmon caught my eye, I only buy this if it is reduced, so from £3.34 down to £1.67, I picked up a couple of packets, one to eat now and one for the freezer. I got cabbage reduced from 68p to 25p, carrots 37p, fruity snack bars reduced to 5p, plus a few other items. I must admit I did spend a lot of time chatting to people about prices, a lovely old couple in their 80's who drove their car there, a nice lady assistant who was reducing some prices, and I pointed a couple in the direction of the reduced salmon, anything to help my fellow shoppers. I have decided that a good way to cut down on your supermarket spending is to chat to a lot of people, make it a social occasion, then you run out of time, especially if you have a bus to catch. After a quick lunch at home, I took my friends dog a walk. Then off to the Blood Donor session in town in my car. It was very busy, but I was prepared to wait to get my free drink and biscuits. 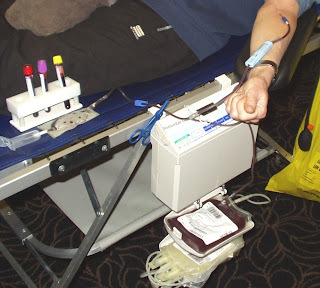 I was instantly recognised by another donor who sat next to me, a friendly chat helped to pass the time. Then I had a lovely surprise, one of the nurses came over to me to introduce herself, her name badge said Ilona. I was chuffed, I have been looking for another Ilona for all of my life and up untill today I have never met one face to face. Like me she hated her name when she was younger, and like me she now likes it. I asked her to say it and she said it like all English people, but I say it with a German accent just as my mother taught me, and no one I have met has been able to copy it. 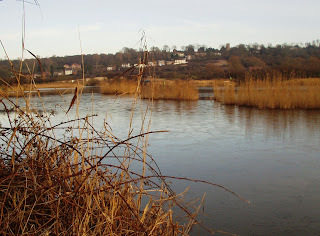 As I was not far from Morrisons I thought it was a good opportunity to call in and get my cat litter, I never like to drive to one place and back again, preferring to do two or more errands in one journey. I had also noticed a special offer on spicy beanburgers, advertised in the leaflets that come through the door, oh yes, I do read them. 80p for four, that's 20p for one, plus some veg, a very cheap meal. I had a scan round to see if any more of my favourites were on offer, I am sure I have radar on my head which draws me towards the bargains. Quorn fillets £1, veg bakes 80p, a quick look at the end of aisle displays, and the radar is buzzing. Felix have a new line in cat food pouches called marinades, introductory offer £2.02 a box of 12, and my cats like it, I must get stocked up before the price increases. I'm looking forward to my day off tomorrow. Judging by some of the posts on different forums I have been reading lately, there seems to be some confusion about why someone might live a frugal lifestyle. Although I am known as the Meanqueen of North Lincolnshire, the only reason I chose the name is because I want to buy things as cheaply as possible, though I would prefer not to buy things at all, and besides, it is rather a catchy name. I am also unmean, I raise money for animal charities, I help people walk dogs, and give my excess vegetables away. Tight is another word for mean, I am not that either, I call myself frugal. But why do I have a frugal lifestyle, giving up what most people would think is normal to have, like central heating and television? The first answer is that if I don't spend money, I don't have to earn it, which gives me more time to do what I want to do. The second answer is that I save money in some areas of my life so that I can channel it into things that are important to me. And the third answer is that I want to reduce my impact on the planet, to rob the earth of it's resources, in my mind, is criminal. I am frugal for all these reasons. I have a car because I like the freedom it gives me, but I keep my journeys to a minimum. I have the internet because it is my entertainment and a learning tool. Television is a big waste of time, and I can keep my body perfectly clean in a couple of bowlfulls of hot water. I took these photographs today as an illustration of a frugal life. 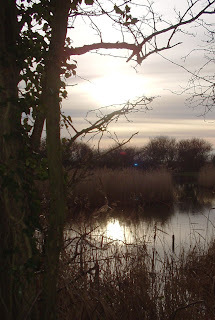 It was a lovely sunny day and I went for a walk across the hills, through the woods, and around the fishing pond, how fantastic is that, and it was free. What did you do this Wednesday afternoon? I've had a bit of a tidy up today, there's a reporter coming with a photographer tomorrow, they want to do a story for the Yorkshire Post. Although I keep the house reasonably clean I do not believe in getting the Dyson out every day, that would use far too much electricity, and the machine would wear out very quickly. Things have to last a long time in this house. For the kitchen floor I brush the crumbs up, then get down on my hands and knees with a cloth and wipe round, no fancy cleaning liquids either, just a squirt of wash up liquid cleans everything. They seem to invent a new cleaning fluid almost every week, I don't even bother to go down the household aisles in the supermarket, it saves a fortune. I have some awful bath foam that someone gave me years ago, the bottle looks nice, but you wouldn't want to put the contents on your body for fear of smelling like a strawberry milkshake. Then I had a brainwave, would it clean my toilet? Bingo, it makes a lovely job, and cleans my sink as well, I don't like to waste anything. A nice free gift dropped through my letter box this morning, a lovely top of the range, plum coloured with silver trimmings, laser engraved, ball point pen. How kind of the company to send me this, I shall treasure it. If I want any more I can order them at £1.49 each, and each one comes in it's own gift box. Thanks for your generous offer, but I'll just stick with this one for the time being. I love libraries, our mobile van comes on a Monday and parks opposite the end of my street. Admittedly they carry a limited amount of books, but I can always find something of interest. Non fiction is my scene, I can't see the point of reading something that is made up, for me, truth is far more exciting. I like autobiographies, vegetable growing, craftwork, computers, and anything else that takes my fancy. If they haven't got exactly what you're looking for it's a good opportunity to enlighten yourself with an unfamiliar subject. I came away with seven books, I'm like a kid when I get home, eager to get into my bag of goodies. 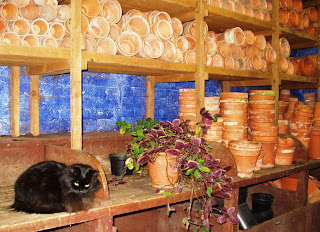 Another miserable day outside, the frost has been replaced with a cold wind, so best to stay indoors. I have always got a couple of craft projects on the go, thinking of new ways to recycle my rubbish. I finished a bottle of shampoo, (it lasted eight months), and the plastic is a lovely shade of green, too nice to throw away. I came up with the idea of making a purse. I cut the top and bottom off with scissors, then cut it lengthways along two sides, then I cut it in half across the middle. I found a blue plastic lid from an old tin and cut two pieces for the ends, and also cut a simple flower for the decoration. I then heated a nail, holding it with a pair of pliers, on the gas cooker, and made the holes around the edges. 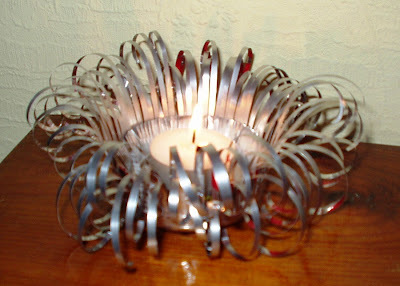 I used silver coloured elastic to join the pieces together. This first prototype needs needs some experimenting with. There is too much give in the elastic, it maybe needs wool or thin cord instead, the plastic is possibly not rigid enough, might have to look at different materials, but hey, not bad for a first attempt. I have now got to pester my friends to save more plastic rubbish for me. Radio 5 Live did a programme tonight on the credit crunch. They were talking about redundancies, job seeking, debt, and how to save money, I listened to see if they were going to play any of my money saving tips that I recorded for them. Lo and behold I heard myself telling the nation to shop in supermarkets only between 5pm and 9pm to get the best bargains, only have one light on at a time in the house, and don't buy fancy cleaning products, diluted washing up liquid will clean everything. Meanqueen has spoken. Drastic measures to keep warm are needed today, it is very very cold, everything has a covering of white frost on it. I performed my morning ritual of breaking the ice on the frying pan I have on the lawn which serves as the bird bath, by banging it against the concrete line post. After re filling and scattering some bread around, I made a hasty retreat indoors. As the inside of my house isn't much warmer than the outside, I thought it would be a good idea to put another layer on, I put a body warmer over my three teeshirts and two sweatshirts, then I put my jacket over that. Time for a wooly hat as well, it really is cold. When I am in the house I alternate between doing my craft work downstairs in the dining room, and on the computer upstairs in the office. I put the gas fire on for a short time, to take the chill off, then I made us all a hot water bottle each. 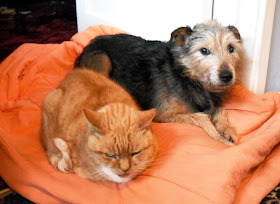 Bugsy and Freddie have theirs under the duvet on my, or should I say our bed, while they sleep on the top, and Lilly has his under his duvet on the arm chair. I have mine on my belly stuffed down between my three pairs of jog bottoms. Another morning another radio interview, this time for BBC Radio Humberside. I just love chatting with Lara King, the presenter, she is so lively and such good fun. Of course the subject of my boys pants came up, and my three years supply of toilet rolls I get from the wholesaler, as well as some other money saving tips, and the plug for the programme tonight. Afterwards, I was booked for a date in March to go into the studios to talk about the Budget, what I think of it, and to offer my own ideas as to what I would put into it. I'm going to have to do some preparation for that one, the Budget is something that usually makes me fall asleep. This afternoon a hunky man turned up at my house with his tripod, camera and lighting equipment, the brief he had been given by his agency wasn't very specific so I filled him in on the background to the story. He then came up with some interesting ideas for the shots, and between us we set them up. I warned him to keep his coat on because of the cold, then I felt sorry for him and put the gas fire on for ten minutes as he was shivering. We did some shots in the garden as well, me holding a bowl of lettuce which amazingly is still alive and edible. I am not sure when this is going appear in the Independant, I'll keep looking at the web site, because I am too mean to keep buying the newspapers. It's six months since I last had a haircut and my fringe is starting to irritate me, falling into my eyes. I have been known to get a pair of scissors and hack it off myself, no, I don't literally hack, I try and copy what I have seen the hairdressers do, lift and trim. It means I can hang on a bit longer before I have to go and get the mess sorted out by a professional. Anyway, I decided to offer my head as a practice model to a student at the college, it's only £3 for a trim. The downside is that the process is painfully slow, and you have to stop yourself from taking the scissors and offering to help the girl out. 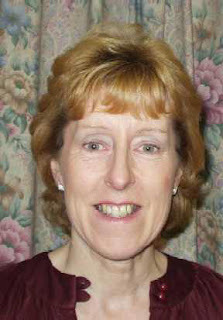 I even went a bit mad and had a blow dry for an extra £1.50, a bit extravagant I thought. Thankfully you are not discharged before the handiwork is inspected by the teacher, so there's no chance of people in the street rolling around in fits of laughter. I stopped off to have a chat with my friend Angela on the way home, showing her my new knitted bag, she was well impressed. We got to talking about money saving tips, and I was amazed that she is almost as frugal as me, she is into skip diving in a big way. She had a basket potted up with flowers and plants in it, with an M & S label on for £7.99. She lifted it out of a skip at the back of their shop, and was shocked to see that they had thrown away perfectly good food products because they were on the last date. Apparently they have a policy of not reducing the prices like the supermarkets do. I think that is scandalous. It has been on the news today that they are closing some shops because they are losing money, I'm not surprised when they are chucking perfectly good stuff in the bin. Well that was an early start to the day. I had to set my alarm for 6.30am, so I would have enough time to have a cup of coffee and wake myself up before BBC Radio Hereford and Worcester rang me. I picked up the station early on the iplayer, aren't computers wonderful, and listened in to get a taste of the theme of the programme. Five to Eight the phone rang and I was live on air. It was all about the TV programme I am on, on Friday night, Hunt for the Tightest Person in Britain. They asked me about wearing boys pants, which I do, because they last a lot longer than girls knickers, which stretch and fall apart after a few months. I love boys pants, they go on forever and so they are cost effective because they hardly ever need replacing. There wasn't much time for chatting. I told them how I wear more clothes inside the house than out, due to the lack of central heating, my choice I may add, and I put my widdle on the compost heap to cut down on wasting water on toilet flushing, don't think they were too impressed with that one. I could almost feel the cringe and a sharp intake of breath. Even more excitement this afternoon, a phone call from a reporter at the Scunthorpe Telegraph. After half an hour of questions, he said he will send a photographer round, he wants to get the article in the paper for tomorrow. A very nice young lady came round with a very big and complicated looking camera, we had a lot of fun in the bedroom with toilet rolls and my pants, don't ask, it's all to do with the programme. Autograph anyone? Here is my latest creation, and it didn't cost me a penny. 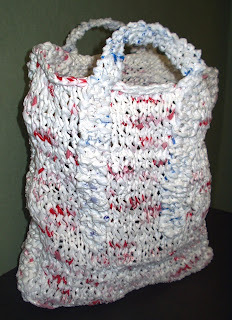 I made this knitted shopping bag out of eleven plastic charity bags, cut into one inch strips. They leave them on your doorstep for a donation but fail to collect when you haven't put anything in them, so I found a use for them. The dimensions are 15" high, 10" wide, with a 4" wide gusset. The handles are made seperately, (3 stitches) and I fixed it all together using a rug pegger. I shall be taking it out on a trial shopping trip later this week, it should stand up to the job because it is pretty strong. Now, what am I going to make next? Time to take the Christmas decorations down, a very quick job for me as I only had this tree decoration that I made, and a few coloured lights along the window sill. I had a very frugal Christmas, in fact I didn't really do Christmas at all. The frenzy of shopping, wracking your brains wondering what presents to get, eating loads of food and drinking yourself silly, not much fun I think. Oh dear, makes me sound like a grumpy old woman, but I visited family on Christmas Day, that was nice, and I had my treats, a bottle of Port and some chocs. My tree has been stripped of it's leaves and berries and put away for next year. I made it out of twigs I had in the garden, cut them to size and nailed them together. The base is an empty tin filled with cat litter, some coloured paper sellotaped around it and foliage attached with elastic bands. 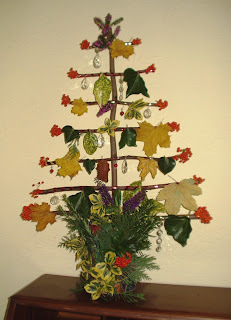 I think my free hand made tree is better than anything you can buy in a shop. There are lots of things you can make for no money, if you look around the hedgerows. 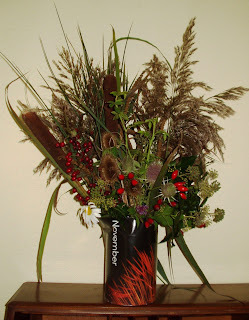 I made this autumn display with foliage I picked from around the fishing pond when I was wa lking Ben, in October. It is so satisfying to make things from scratch, even better if you have recycled something that would have been thrown away. It makes me think about what people did before High Street shops, and wouldn't it be great to get back to basics and make things again. The way things are going at the moment, with the threat of people losing their jobs and shops closing, we might have to. Then all the past skills that our grandparents used to have will once again be resurected. It's been a very cold day today in this house without heating, but we have managed. I gave in to the cats though and put the gas fire on for a while in the living room, Freddie and Lilly sat gazing lovingly at the warm glow. This morning I was trying to get my knitted bag finished, only the handles left to put on. I saw something on a web site about cutting plastic carrier bags into strips and knitting them into a new bag. I have a lot of those charity bags which are a lot bigger but they never seem to collect them, so I have been using those. I'll put a picture on here when it is finished. This afternoon I took my friends dog, Ben for a walk, some people think dog walking is a chore, but I love it. I have three cats so I can't have a dog, I wouldn't want the ties anyway, so it suits me to borrow someone elses dog. I have been walking Ben for three years, he is adorable. He lives very close to me and I have a key to the house so I can take him out whenever I like. Within minutes we are in the countryside, it's very high up here and the views are stun ning across the River Trent, on a clear day I can see for miles across Yorkshire. I am definately a country bumpkin at heart, what could be better than the woods and fields, the valleys and the hills, I'm in my element. Here is my best friend. I don't like spending hours in the kitchen cooking fancy food, after all, it all goes the same way whether you have spent three hours on it or five minutes. Plain and simple food suits me and my purse. Tonight I have made a veggie stew in a big pan that will last me three days, and it's lovely. I picked some sprouts and cabbage from my garden, then I added half a swede, two big carrots, two onions, a tub of cooked green tomatoes I froze in October when it looked unlikely that they would ripen, two apples, some pot barley, bulgur wheat, sesame seeds, linseed seeds, raisins, and a stock cube and spices, and sauce mix. My mum used to make stews like this, just throw anything in that you have, you can't beat it on a cold winters night. I'm iff to get a glass of Port now, my Christmas treat. This morning I went into town to get some cat food from the market, this is the cheapest place to get it from. They often have good quality food at knock down prices because they are able to buy in stocks that are near or just beyond the sell by date. As my cats can't read it doesn't matter. I was unlucky today, they hadn't been able to get any in. 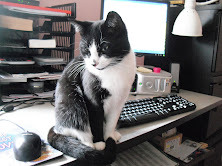 As cat lovers will know, their pets are the most finicky eaters, mine like Felix As Good As It Looks, but they have had to have the ordinary Felix for the past few days. Oh dear, you should have seen the sulks. Anyway, resort to plan B, I had a scout around in the cut price stores and found some sachets at a reasonable price. I thought it's worth a try because they have had the dry food of the same name, and they like it. My next stop was Sainsbury's. I went in there because I knew I could look through all the papers without being disturbed, they are in the alcove away from the rest of the shop. I wanted to find anything that had my name or my photograph in. I am in a television programme on Channel 4 on Friday night at 7.30pm, it's called, 'The Hunt for the Tightest Person in Britain,' and I want to keep the cuttings for my scrap book. I didn't find any. Not to worry I had a quick check round the shop for any bargains, I don't buy much here because it is too expensive. I got three packs of multigrain bread rolls for £1, a big bag of onions for 50p, and a bag of grapes at half price. Off I went to Tesco for the rest of my shopping. I didn't spend a lot because I only needed a few things that I am running out of, some carrots and swedes, and I got a butternut squash because they are on special offer. Felix cat food is on special offer so I got a box, it's not the one they like but tough, that's what they are getting. I don't shop for food very often but when I do I spend time getting the best value for my money. When I look at all the choice on the shelves I wonder why people buy such rubbish, and the prices are just crazy, they don't seem to mind, we'll have one of those, and those, bung it in the trolley. My shopping trip is a military operation. I put the computer on this afternoon to check on the forum of http://www.downthelane,net/ I am a moderator on there and it's fun. I see someone has posted that I am mentioned in the Daily Mail, and I also found out that The Independant has printed a letter I sent them, so off I went to my local paper shop to get my copies for my scrap book. I wouldn't ordinarily buy newspapers, I read them on the internet, but I think I can afford a couple. Oh dear, maybe I'm not the tightest person in Britain then.